Autoconfiguration should work for any current Mozilla Thunderbird version that supports configuration assist. Name your account whatever you would like shown to others, then type the full email address name and your password. A permission popup may ask if you will allow our ‘autoconfigure.nikola.com‘ site to configure your e-mail settings, choose ‘Accept‘. After allowing this permission, you will be auto-configured with all the settings necessary to begin using your Nikola e-mail account. 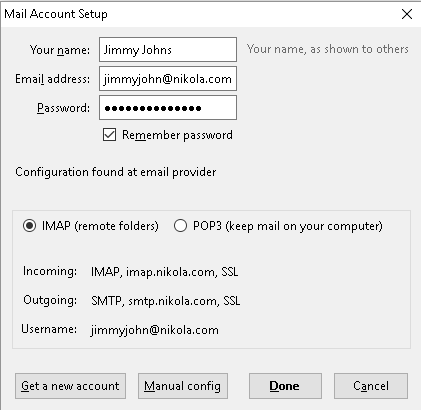 You only have to choose whether you would prefer POP3 or IMAP for your account.